The line traversing Kawasaki City (the first) is planned to strengthen the communication with the city and the center of Tokyo and the other central cities which are the central business cities in the metropolitan region, and is under construction now by Metropolitan Expressway Co.,Ltd. 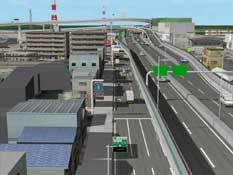 Among that, the Daishi junction has become the complicated form where the high level roads and the semi- underground roads congest. 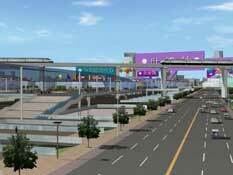 Depending, in order to deepen the commonness recognition of everyone of the local residents who take part in this construction and the persons concerned with the business, we created a 3DVR which begins the car simulation. In addition, Daishi ventilation place built in a loop, makes simulation to be aimed for the common property of the image with the applying companies when they order technical suggestions constructions. It is used in the construction summary presentation, and serves to connect with the better technology suggestions by securing the situation of the construction place. 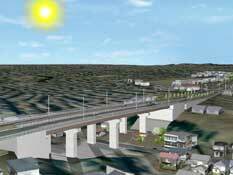 Japan Bridge & Structure Institute, Inc.
Before the city planning road development of Machida city, we created the VR data and the AVI animation on the basis of the VR data as a document for explanation to the local residents. 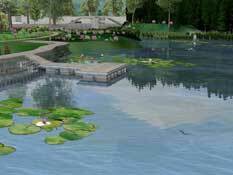 Concerning the local products in the surrounding of the planned bridges, we created the 3 dimensional models on the basis of local reports. About the sunlight study which uses the data which are completed, we did the study using the UC-win/Road visual option-shadow option and captured the animation. We created the document for editing the AVI on the basis of the animation. Using the functions such as the visual option in addition to the practical use as the ordinary VR data which utilizes the traffic flow expressions, it became a document for more effective presentation. Erhai Lake is located to the Yunnan Province (similar to the Japanese Lake Biwa,), water contamination gets worse by influx such as decrease and life draining of water level. 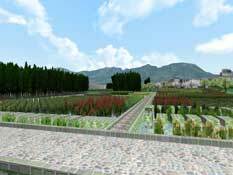 For that, as a business model, they made ecological restoration construction for of the environment and the ecological protection. 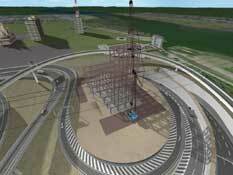 3DVR was used in the summary of this construction to explain the effect. This data reproduced the terrain of this area to real as a contour line. From various points of view, we made the simulation of the procedure of the development, the texture of the models is original, the 3D trees and the fake light are fine. In addition, it expressed the effect due to environmental improvement, including the circumstances like fishes swimming. In conclusion, for making the AVI, music is inserted, added also the explanation with the sound. As a public information, we can use an AVI animation in future. 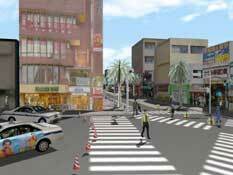 It is a VR simulation of the transit mall done with the social experiment of the international avenue in Okinawa prefecture Naha city. 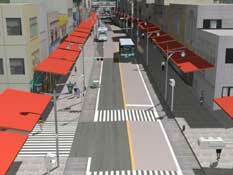 The transit mall is expected for a real execution from the spring of next year. This VR simulation was created to compare and examine visually various measures during the execution of the transit mall. By this data, we compare the division methods (color of the pavement, color combination, planting etc) and eaves on the sidewalk, the roadside trees. 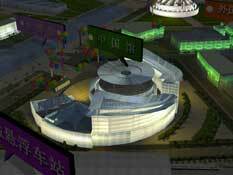 The Shanghai international exhibition in 2010 expresses the main street town of the international exhibition symbol and its underground space, and we use a 3DVR to have the concrete recognition by the opening image for each concerned institution. In order to express the opening theme of the Shanghai international exhibition "Better City Better Life", the main street has become the arcade designed in the shape of an opened umbrella, with a unique lighting. 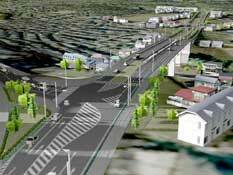 Using the CAD plan, we created the street map for UC-win/Road, and excepted the main roads, we use the main functions that can express in UC-win/Road such as modeling of symbol architecture, sand guards execution method of an underground, a linear motor car, operation setting such as subways, a rial flag function of the flags of all nations, expression of a fake light, a flow of people, setting of traffic flow.